Approved in May 2016, the new Interventional Radiology-Integrated Residency Program officially launched July 1. 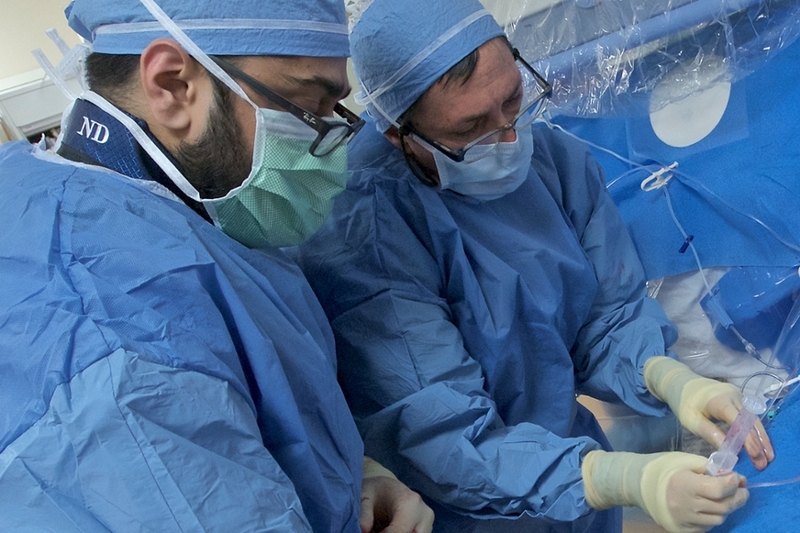 More than four years in the making, the IR Residency Program responds to the growing demand for and interest in image-guided medicine to treat an increasingly wide range of diseases and conditions. The IR Residency Program opened for applications September 15 with a deadline of November 15. Applicants must complete a clinical internship, preferably in surgery. Interviews will take place between October 2016 and Jan 2017. Successful candidates match in March 2017 for a residency start date of July 1, 2018. The five-year integrated program starts with three years of the same diagnostic radiology training as diagnostic radiology residents. Fourth year training concentrates on the clinical and procedural aspects of interventional radiology practice. Clinical rotations include vascular surgery, transplant hepatology, surgical ICU, critical care/pulmonary ICU, medical oncology, and medical consultation services including cardiology and nephrology. In the fifth year, residents concentrate on procedural IR with emphasis on providing excellent longitudinal patient care as disease specialists. Those who want to pursue diagnostic radiology but do not initially match into the IR-I program have other pathways into the specialty. Graduates of diagnostic radiology residency may complete an IR fellowship, at least until 2020 when the fellowship program ends, or they may apply for an independent, two-year interventional radiology residency to commence after their diagnostic radiology residency. Alternatively, diagnostic radiology residents may apply in their third year for “early specialization” ininterventional radiology (ESIR). ESIR allows the diagnostic radiology resident to complete a curriculum which makes them eligible for advance entry into the second year of an independent IR Residency. These options all have separate match processes. Graduates of the IR-I residency will qualify to take the Interventional Radiology and Diagnostic Radiology examinations offered by the American Board of Radiology. The IR/DR certificate recognizes competency in both diagnostic radiology and interventional radiology. Certificate holders can practice both diagnostic radiology and interventional radiology.